Residents burn tires, block roads after enduring 460 rocket attacks in 2 days. 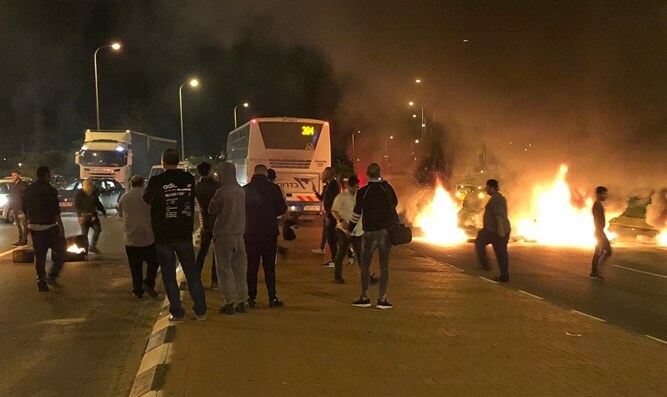 Dozens of residents of the Gaza periphery protested at the entrance to Sderot against the government's ceasefire agreement with the Hamas terrorist organization Wednesday night. The protesters burned tires and blocked Route 34 between the Shaar Hanegev junction and the Nir Am intersection. The entrance to Sderot was also blocked. Police requested that motorists find alternate routes. Earlier today, dozens of residents of the Gaza periphery demonstrated at the Kerem Shalom Crossing, the primary entry point for goods and humanitarian aid into Gaza. In addition, the Eshkol Region parents committee called on parents in the Gaza periphery not to send their teenage children to high school in protest. The residents protested what they called the government's inability to stop the barrage of over 460 rockets and mortars which were fired by terrorists in the Gaza Strip on Monday and Tuesday. One person was killed and over 50 injured during the barrage. Yesterday, Israel accepted the ceasefire which had been declared by Hamas and other terrorist organizations in Gaza. Defense Minister Avigdor Liberman resigned Wednesday in protest against the ceasefire agreement. About 1,000 residents protested last night. A similar protest is expected tomorrow by the Azrieli junction in Tel Aviv.